Thank you for visiting the website of Parkside Dental Care where “we’re making smiles.” Located in Fairfield, CA, our dentists strive for excellence in dental care, and our passion is satisfying every patient. Once you are a patient of ours, you will never have to worry about feeling like a stranger in our office. When you visit Parkside Dental Care, you become a member of our family. We will treat you with respect, and offer you the same first-rate service that we offer our own families when they come into the office for dental care. Our commitment to you is that we will provide a family-friendly environment while offering the latest advances in dental technology. These focuses have allowed us to remain leaders in dentistry year after year. We value each patient’s smile. No matter who you are or what your circumstance may be, your smile is important to us. When you come in for an appointment, expect to a receive personal care that meets your needs. Although we hear again and again that our patient’s treatments were relaxing and pain-free, for those who still feel anxious about their dental care, we offer nitrous oxide, sedation, and/or hand-holding to soothe worries. Our dentists also have experience working with special needs patients. We are an all-in-one dental practice that offers the services of a large scale dental facility, yet our atmosphere is surprisingly quaint. 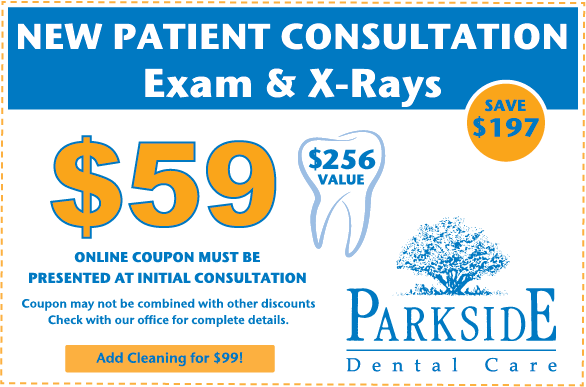 Enjoy the best of both worlds when you visit Parkside Dental Care. When you need specialized dental work, you don’t have to find another practice because we have many specialists that practice here offering general dentistry, cosmetic dentistry, orthodontics, pediatrics, periodontics, dental implants and oral surgery including a dentist that has special privileges for hospitals. Our dentists collaborate with each other and work together with you as a team to provide you with the best patient care. Your patient care will also be enhanced by our use of state-of-the-art equipment. Some of our advanced technology include digital x-rays, Invisalign®, and soft tissue dental lasers. Our use of a Cavitron allows us to deliver comfortable, ultrasonic scaling. We have recently begun offering sedation dentistry for oral surgery including intravenous sedation. Additionally, in an effort to go green, we have converted to digital charting and communications. Located in Solano County, our, Solano County, Fairfield office is in The Parkside Professional Center building which is within walking distance of the Solano Town Center Mall. We are easily accessible for those coming from Rio Vista, Vacaville, and Benicia, and just a short drive from beautiful Napa. We would love to meet you and your family. We are available Monday through Friday between the hours of 6 AM to 7 PM and on every other Saturday. We also have dentists on call 24/7. Our billing is completed in office, and we offer low or no interest dental financing through SpringStone and Care Credit. Call us today at 707-402-8802 to schedule an appointment and personally experience how “We’re Making Smiles”.